Our Xmas tradition is to decorate a Norfolk Island Pine. 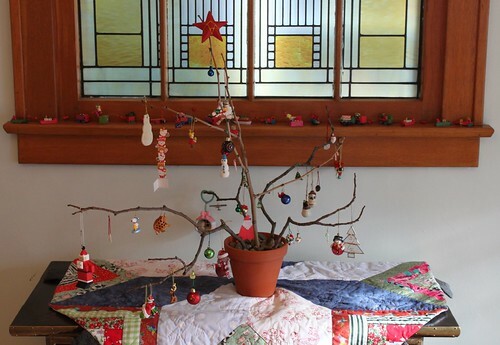 It tolerates the attention but prefers to be an indoor/outdoor tree and is usually completely dried from the lights at the end of the holiday season. This year I was thinking about buying a metal or wooden reusable tree. 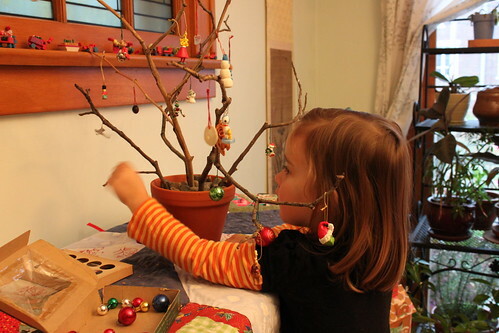 Then I had a brainstorm: let's make our own branch tree! 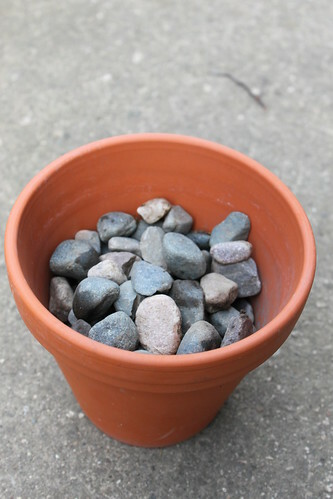 I filled an empty clay pot with garden stones. Sand or pea gravel would also work well. Lil helped me gather multi-pronged branches from the backyard. 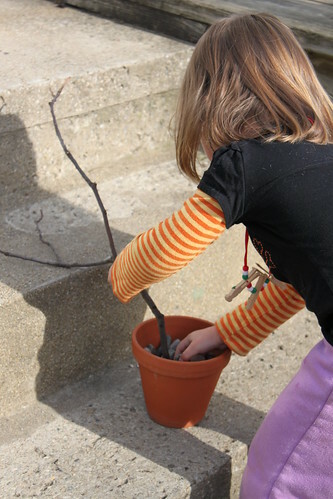 We inserted them into the stones and added more on top to hold the branches in place. I brought the 'tree' inside and wondered whether it was a dumb idea. 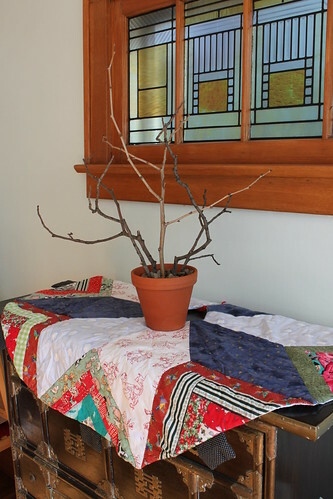 The branches looked out of place on the quilted tree skirt made by my grandmother. We unwrapped our collection of miniature ornaments and added them to the tree. 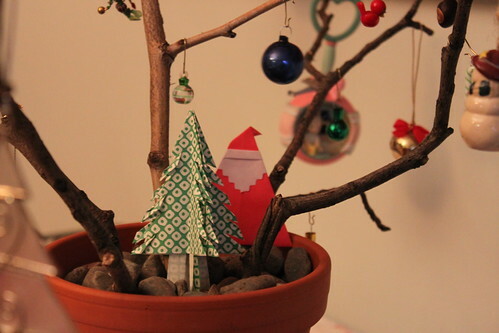 I placed a few pieces of holiday origami at the base. When all the decorations were placed, I fell in love. Our tree is earthy yet shows off our ornaments. I don't have to worry about leaves drying out or presents being dirtied by soil. Best of all, the tree cost nothing and can be returned to the yard at the end of the season. I am also in love with my new camera. I brooded about whether I needed a DSLR for months and finally bought a Canon EOS Rebel T1i Digital SLR Camera on Friday. It is amazing! I'm still learning how to use it well, but the pictures I'm getting are already so much better than I could take with my Powershot. Case in point: I rarely took pictures of Hawise before because the old camera would not react quickly enough to capture her ever moving body. 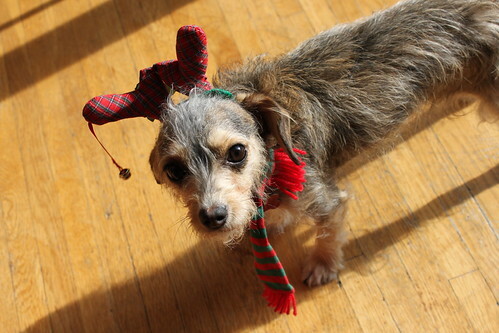 Today I recorded another xmas tradition with the DSLR: torturing the dogs with costuming.